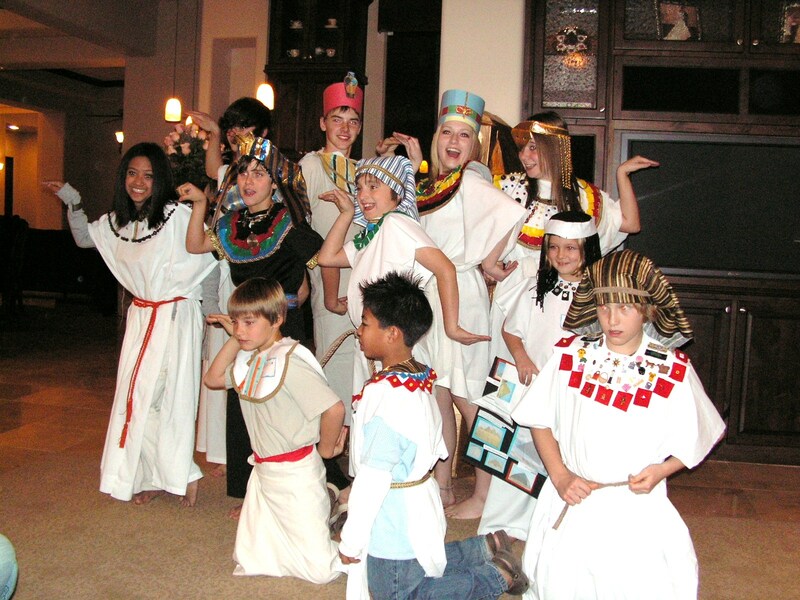 Last night was our homeschool co-op Egyptian night… and what fun it was! The costumes were highly decorative, the food lavish, the reports ingenuitive, the show stupendous! The Egyptian delicacies were absolutely delicious. We decided that if we were stuck in Egypt we would at least be able to survive on the food. 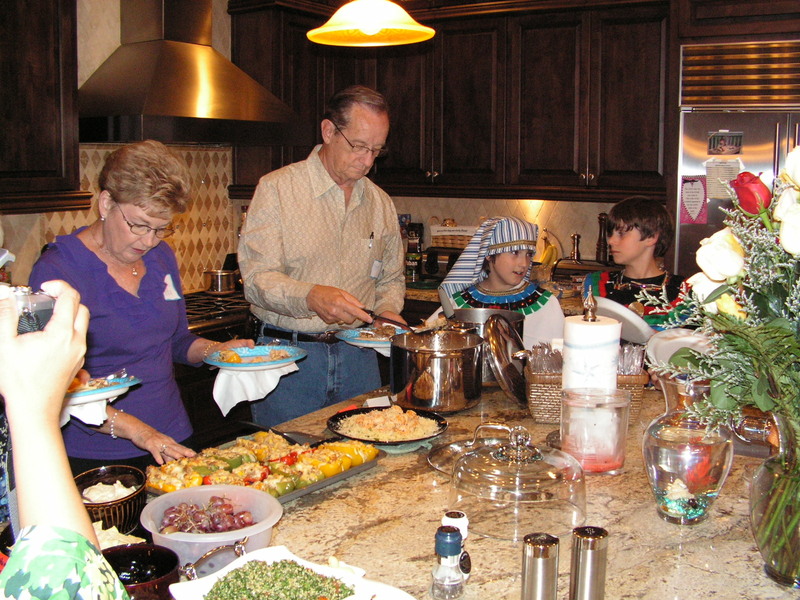 There was chicken and rice, beef and rice, stuffed bell peppers, couscous, garlic shrimp, parsley salad, humus, pomegranates, cucumber-feta salsa with pita chips, pita bread, fig & date bread, and many more that I can’t remember at the moment. We had two sets of grandparents joining in on the evening events. The kids displayed their plethora of projects that they have been mass producing for the last two months. 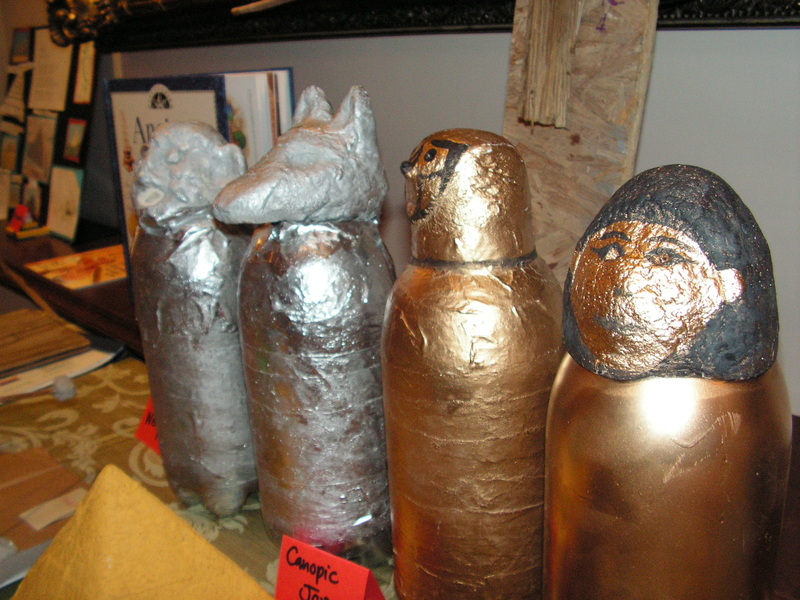 These are the canopic jars that the Pharaoh’s organs were stored in for his burial. 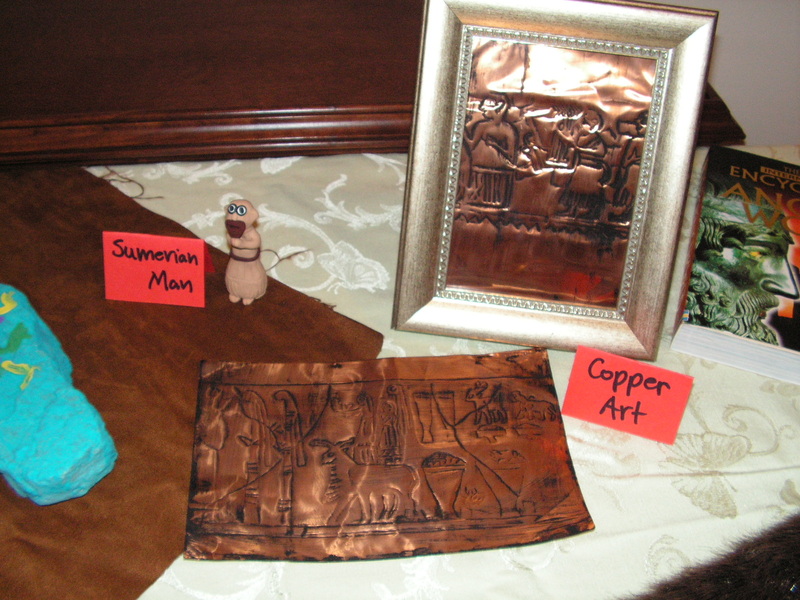 Following are some copper bas reliefs and a little Sumerian Priest. We studied ancient civilizations before Egypt, so those crafts were also out for others to peruse as well. 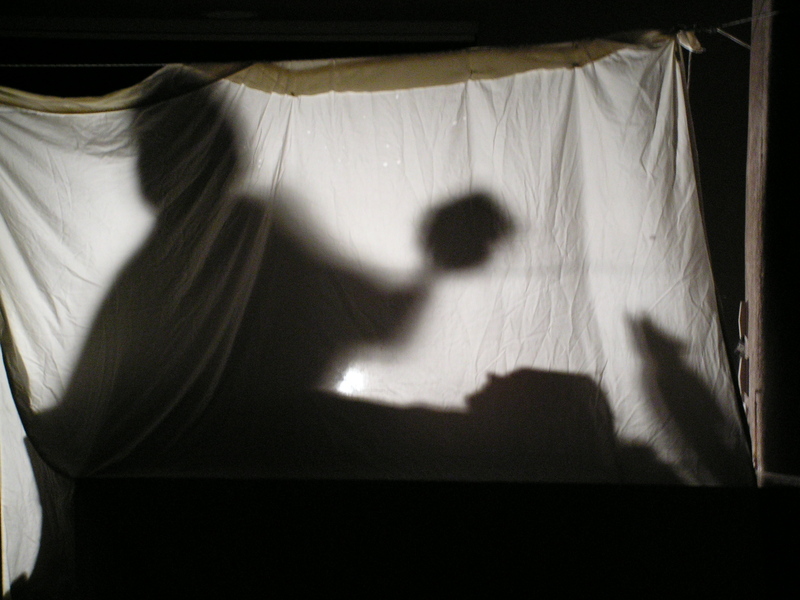 The highlight of the evening was a fully narrated shadow show put on by the high school students of the embalming process of a pharaoh including the removing of organs. It was really well done…. complete with knife sharpening sound effects, the pulling out of the brains (yarn) with a little hook, and the stomach even exploding so there were wet marks all over the sheet for the dramatic effect (water balloons.) The mummy kept giggling, which made it even more humorous. Note the jackal-headed canopic jar for the storage of the intestines. Man, did we laugh…. so did the performers. The kids would be mortified if I used this last picture for the Christmas card this year… it’s tempting…. but maybe world-wide exposure on wordpress is enough. 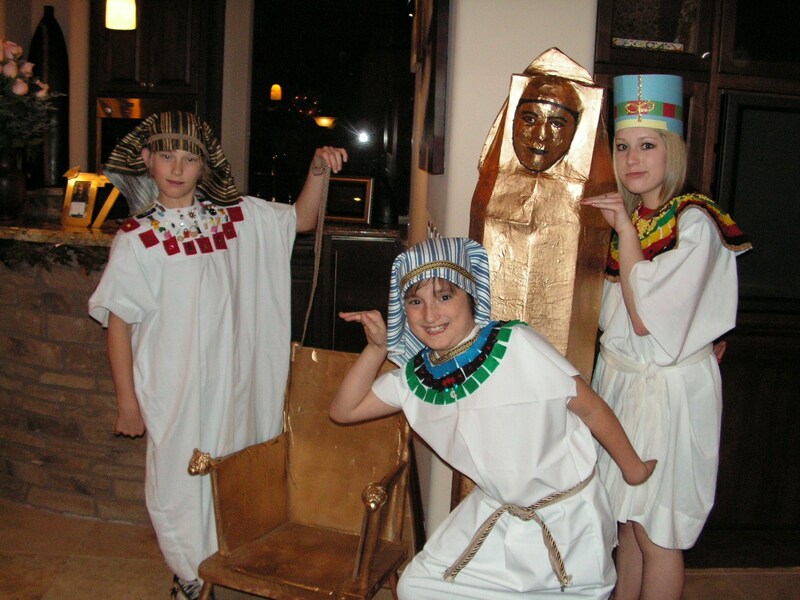 :oP They are pictured with a life-size sarcophagus made of solid gold as well as King Tut’s chair with the lion-headed arm rests. Yes, today I slept in. Rick and I went out for breakfast. We did some shopping. I am much relieved that Egypt is behind us. I’m pretty certain the kids are too. This entry was posted on November 22, 2008 at 3:44 pm and is filed under Uncategorized. You can follow any responses to this entry through the RSS 2.0 feed. You can leave a response, or trackback from your own site. Connie, I found that song on youtube and played it for the kids as well as Steve Martin’s King Tut song. What a laugh from the past. See you in 12 days! Wooo HOoo! That looks like such a cool experience. The reputation as “reclusive homeschool kids who are afraid of other kids” doesn’t apply to your group…Do you see that clip from The View this week about how horrible we all are? MTAE, yes, I’ve heard that we are demented. I’ve looked up the word and the whole topic is indeed blog-worthy. A prime example of foot in mouth disease.